Prima Power Laserdyne’s SmartPerf tool now is available on the company’s Nd:YAG and fiber-laser systems. Designed for on-the-fly laser drilling of simple to complex patterns of holes in linear and cylindrical paths in 2D and 3D parts, the offering ensures quality holes in terms of metallurgy and geometry. Higher productivity is accomplished by eliminating the need for acceleration and deceleration at each hole location. The on-the-fly drilling is effective for precision drilling small-diameter (0.2 to 0.6 mm) holes. Thousands of holes can be produced quickly over a 3D surface in a single setup, and they can be drilled at steep angles and in difficult-to-machine materials. SmartPerf also is used for producing hole patterns involving trepanning and standard precision drilling. 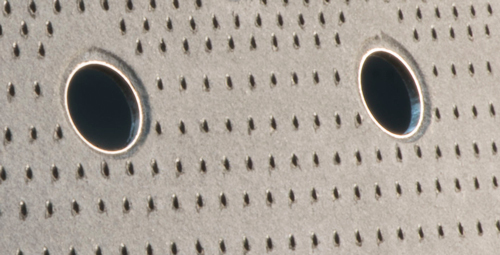 Common applications involve drilling a pattern around a pre-existing machined feature and creating custom spray patterns based on an array of non-uniformly spaced, sized and shaped holes. It makes possible new laser-drilling applications such as fuel filters and noise-abatement panels.